The depth of skills necessary for pilots to achieve lasting UPRT skills that can be implemented cannot be imparted in two flights or less. It takes most pilots three or more flights to provide training of lasting value. This is a fact demonstrated to APS through the training of many thousands of professional pilots across the USA and around the world. Some of the key attributes of systematic training which are not accomplished through mere exposure include repetition to proficiency, long-term retention, lasting skill development, and the embedding of repeatable strategies. It simply takes adequate practice. By providing sufficient opportunity to repeat the actions and skills required to recover from an upset, comprehensive training provides a much better chance of long-term retention than through just exposure. With multiple training sessions under careful IP supervision, the pilot can repeat a properly executed recovery strategy numerous times to gain accuracy and retention. Providing significant opportunity for repetition of a properly executed recovery strategy ingrains skills within the pilot so they will be available even in the most confusing and disorienting situations which could be encountered. There are additional benefits from spending the time that differentiates effective training from initial exposure. Through flying multiple recoveries and all-attitude awareness exercises, increased manual handling skills are gained that cannot be developed through brief exposure. The ability to develop mental models and pattern recognition of escalating conditions results in justifiable confidence as ability is increased. Training allows for the pilot to achieve three levels of ability with regards to upset recovery. First, by experiencing multiple exercises and scenarios in combination with focused academics, the pilots’ awareness as to the aerodynamic situation of the aircraft is powerfully enhanced. Second, this awareness can assist in intervening to prevent the upset process from escalating in the first place. Awareness fosters prevention. 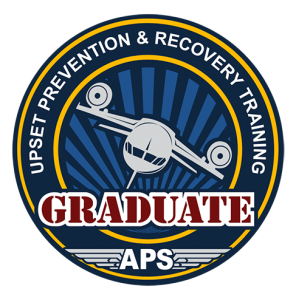 Should the aircraft approach an upset situation, awareness and proficiency acquired through training allow the pilot to maneuver successfully to prevent an impending upset. Finally, for those situations where awareness and prevention were not enough to prevent the upset, such as an unexpected wake turbulence encounter, training ingrains those skills necessary to recover the aircraft to controlled flight.